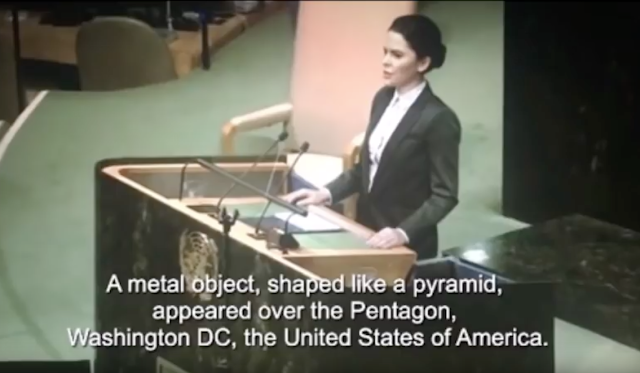 UFO SIGHTINGS DAILY: "Leaked" footage of United Nations discussing giant UFO pyramid over the Pentagon, Feb 2019, video, UFO Sighting News. "Leaked" footage of United Nations discussing giant UFO pyramid over the Pentagon, Feb 2019, video, UFO Sighting News. Here is something mind-blowing. A speech was given by Aliya Prokofyeva in the United Nations building...yes its really at the United Nations. Its not faked. This is video taken at the United Nations podium. She gives witness testimony about a giant triangle UFO hovering over the Pentagon in Washington DC. Even thought the UN asked to not record...of course thats the time when you know something important is worth recording. So yes, its legit. What really is interesting here is that its a Russian woman, probably a spy that is releasing the information to the UN, not an American, not a US congressman or Senator or President...but a Russian! Scientists recently measured mysteriously repeating radio signals coming from a galaxy 1.5 billion light-years away. FRB 180814.J0422+73 was the signals name. The repeating signal was part of 13 fast radio bursts (FRBs) detected by a new telescope in Canada. This signal was the same signal received from the triangle UFO over the Pentagon. The meaning of the signal...still not divulged to the public...but must be very significant...maybe even a final warning before a cataclysmic event. Now hear me. Many will try to debunk and tell you that this video is a lie...but believe me...they base their words on optioning without a single fact to back them up. This...is 100% real.